. 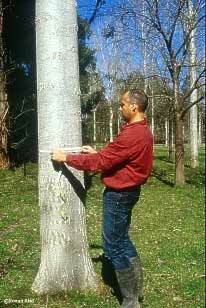 : Farm Forest Line - Measurement and analysis:. Being able to measure the characteristics of a tree or forest provides a snapshot in time. Repeated measurements, done over a number of years, can provide a better understanding of how a forest is changing. Diameter growth, volume increments and levels of competition can be monitored so that silvicultural or harvesting operations are well timed. Measurements can also be made of variables that indicate the impact a forest has on agricultural productivity or land degradation. For example, a farmer can use height measurements of a shelterbelt to predict the area of the sheltered zone. Similarly, the basal area of a forest is commonly proportional to its canopy area and may be a useful guide to determining tree water use in salinity recharge areas. This information can be used to make better informed farm management decisions that will enhance the value of the forest. There is a range of relatively cheap equipment that can be used to collect data on many aspects of farm forestry including tree growth, soil chemical properties, water table depths, pasture yields and wind speeds. Farmers may already be collecting information on crop yields and animal production. This information can be used to examine the impact that shelterbelts or other forestry projects may have on production. Some farmer networks are now compiling results of tree measurements and other data from across their regions to improve their planning and development work. In order to compare results across a number of farms it is important to adopt standard measurement and documentation procedures.